हिंदू सभ्यता .... जो मानवता को दास बनाने और उसका दमन करने की एक क्रूर युक्ति है और इसका उचित नाम बदनामी होगा। एक सभ्यता के बारे मे और क्या कहा जा सकता है जिसने लोगों के एक बहुत बड़े वर्ग को विकसित किया जिसे... एक मानव से हीन समझा गया और जिसका स्पर्श मात्र प्रदूषण फैलाने का पर्याप्त कारण है? "हालांकि मैं एक अछूत हिन्दू के रूप में पैदा हुआ हूँ, लेकिन मैं एक हिन्दू के रूप में हरगिज नहीं मरूँगा!" आम्बेडकर एक सफल पत्रकार एवं प्रभावी संपादक थे। अखबारों के माध्यम से समाज में उन्नती होंगी, इसपर उन्हें विश्वास था। वह आन्दोलन में अखबार को बेहद महत्वपूर्ण मानते थे। उन्होंने शोषित एवं दलित समाज में जागृति लाने के लिए कई पत्र एवं पांच पत्रिकाओं का प्रकाशन एवं सम्पादन किया। इनसे उनके दलित आंदोलन को आगे बढ़ाने में महत्वपूर्ण मदद मिली। उन्होंने कहां हैं की, "किसी भी आन्दोलन को सफल बनाने के लिए अखबार की आवश्यकता होती हैं, अगर आन्दोलन का कोई अखबार नहीं है तो उस आन्दोलन की हालत पंख तुटे हुए पंछी की तरह होती हैं।" डॉ॰ आम्बेडकर ही दलित पत्रकारिता के आधार स्तम्भ हैं क्योंकी वे दलित पत्रिकारिता के प्रथम संपादक, संस्थापक एवं प्रकाशक हैं। डॉ॰ आम्बेडकर ने सभी पत्र मराठी भाषा में ही प्रकाशित किये क्योंकि उनका कार्य क्षेत्र महाराष्ट्र था और मराठी वहां की जन भाषा है। और उस समय महाराष्ट्र की शोषित एवं दलित जनता ज्यादा पढ़ी लिखी नहीं थी, वह केवल मराठी ही समझ पाती थी। कई दशकों तक उन्होंने पांच मराठी पत्रिकाओं का संपादन किया था, जिसमे मूकनायक (1920), जनता (1930), बहिष्कृत भारत (1927), समता (1928) एवं प्रबुद्ध भारत (1956) सम्मिलित हैं। इन पाँचो पत्रों में बाबासाहब आम्बेडकर देश के सामाजिक, राजनीतिक एवं आर्थिक मुद्दों पर अपने विचार व्यक्त करते थे।  साहित्यकार व विचारक गंगाधर पानतावणे ने 1987 में भारत में पहली बार आम्बेडकर की पत्रकारितापर पी.एच.डी. के लिए शोध प्रबंध लिखा। उसमें पानतावने ने आंबेडकर के बारे में लिखा हैं की, "इस मुकनायक ने बहिष्कृत भारत के लोगों को प्रबुद्ध भारत में लाया। बाबासाहब एक महान पत्रकार थे।"
↑ "BR Ambedkar's anniversary: His quotes on gender, politics and untouchability". ↑ Jaffrelot, Christophe (2005). Dr. Ambedkar and Untouchability: Fighting the Indian Caste System. New York: Columbia University Press. पृ॰ 2. आई॰ऍस॰बी॰ऍन॰ 0-231-13602-1. ↑ अ आ इ Pritchett, Frances. "In the 1890s" (PHP). अभिगमन तिथि 2 अगस्त 2006. ↑ "What's in a name? : Those who invoke Ambedkar are complicit in a forgetting, much like Gandhi". ↑ "Mahar". Encyclopædia Britannica. britannica.com. मूल से 30 November 2011 को पुरालेखित. अभिगमन तिथि 12 January 2012. ↑ Ahuja, M. L. (2007). "Babasaheb Ambedkar". Eminent Indians : administrators and political thinkers. New Delhi: Rupa. पपृ॰ 1922–1923. आई॰ऍस॰बी॰ऍन॰ 8129111071. मूल से 23 December 2016 को पुरालेखित. अभिगमन तिथि 17 July 2013. ↑ अ आ Pritchett, Frances. "In the 1910s" (PHP). मूल से 23 November 2011 को पुरालेखित. अभिगमन तिथि 5 January 2012. ↑ "Ambedkar teacher". मूल से 3 April 2016 को पुरालेखित. ↑ "Bhimrao Ambedkar". columbia.edu. मूल से 10 February 2014 को पुरालेखित. ↑ Kshīrasāgara, Rāmacandra (1 January 1994). "Dalit Movement in India and Its Leaders, 1857-1956". M.D. Publications Pvt. Ltd. अभिगमन तिथि 2 November 2016 – वाया Google Books. 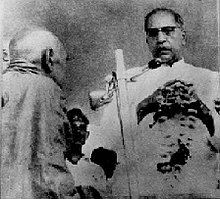 ↑ Ambedkar, Dr. B.R. "Waiting for a Visa". columbia.edu. Columbia University. मूल से 24 June 2010 को पुरालेखित. अभिगमन तिथि 15 April 2015. ↑ Keer, Dhananjay (1971) . Dr. Ambedkar: Life and Mission. Mumbai: Popular Prakashan. पपृ॰ 37–38. OCLC 123913369. आई॰ऍस॰बी॰ऍन॰ 8171542379. ↑ Harris, Ian (संपा॰). Buddhism and politics in twentieth-century Asia. Continuum International Group. ↑ Tejani, Shabnum (2008). "From Untouchable to Hindu Gandhi, Ambedkar and Depressed class question 1932". Indian secularism : a social and intellectual history, 1890-1950. Bloomington, Ind. : Indiana University Press. पपृ॰ 205–210. आई॰ऍस॰बी॰ऍन॰ 0253220440. अभिगमन तिथि 17 July 2013. ↑ Jaffrelot, Christophe (2005). Dr Ambedkar and Untouchability: Analysing and Fighting Caste. London: C. Hurst & Co. Publishers. पृ॰ 4. आई॰ऍस॰बी॰ऍन॰ 1850654492. ↑ "Dr. Ambedkar". National Campaign on Dalit Human Rights. मूल से 8 October 2012 को पुरालेखित. अभिगमन तिथि 12 January 2012. ↑ Benjamin, Joseph (जून 2009). "B. R. Ambedkar: An Indefatigable Defender of Human Rights". Focus. Japan: Asia-Pacific Human Rights Information Center (HURIGHTS OSAKA). 56. ↑ Thorat, Sukhadeo; Kumar, Narender (2008). B. R. Ambedkar:perspectives on social exclusion and inclusive policies. New Delhi: Oxford University Press. ↑ Ambedkar, B. R. (1979). Writings and Speeches. 1. Education Dept., Govt. of Maharashtra. ↑ "Dr. Babasaheb Ambedkar". Maharashtra Navanirman Sena. मूल से 10 May 2011 को पुरालेखित. अभिगमन तिथि 26 December 2010. ↑ "मनुस्मृति-ब्रिटैनिका विश्वकोश". www.britannica.com. ब्रिटैनिका विश्वकोश. अभिगमन तिथि २३ जून २०१८. ↑ "भारत में कैसे बढ़ा 'मनुस्मृति' का महत्व". ↑ "'क्या मनुस्मृति दहन दिन मनाएगा संघ?'". ↑ Kumar, Aishwary. "The Lies Of Manu". outlookindia.com. मूल से 18 October 2015 को पुरालेखित. ↑ "Annihilating caste". frontline.in. मूल से 28 May 2014 को पुरालेखित. ↑ Menon, Nivedita (25 December 2014). 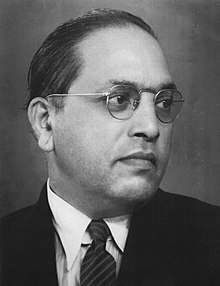 "Meanwhile, for Dalits and Ambedkarites in India, December 25th is Manusmriti Dahan Din, the day on which B R Ambedkar publicly and ceremoniously in 1927". Kafila. अभिगमन तिथि 21 October 2015. ↑ "11. Manusmriti Dahan Day celebrated as Indian Women's Liberation Day" (PDF). मूल से 17 November 2015 को पुरालेखित (PDF). ↑ Keer, Dhananjay (1990). Dr. Ambedkar : life and mission (3rd संस्करण). Bombay: Popular Prakashan Private Limited. पपृ॰ 136–140. आई॰ऍस॰बी॰ऍन॰ 8171542379. ↑ Kothari, R. (2004). Caste in Indian Politics. Orient Blackswan. पृ॰ 46. ISBN 81-250-0637-0, ISBN 978-81-250-0637-4. ↑ Pritchett. "Rajah, Rao Bahadur M. C." University of Columbia. अभिगमन तिथि 5 जनवरी 2009. ↑ अ आ इ Pritchett, Frances. "In the 1930s" (PHP). अभिगमन तिथि 2 अगस्त 2006. ↑ Jaffrelot, Christophe (2005). Dr Ambedkar and Untouchability: Analysing and Fighting Caste. London: C. Hurst & Co. Publishers. पपृ॰ 76–77. आई॰ऍस॰बी॰ऍन॰ 1850654492. ↑ "May 15: It was 79 years ago today that Ambedkar's 'Annihilation Of Caste' was published". मूल से 29 May 2016 को पुरालेखित. ↑ Mungekar, Bhalchandra (16–29 July 2011). "Annihilating caste". Frontline. 28 (11). मूल से 1 November 2013 को पुरालेखित. अभिगमन तिथि 18 July 2013. ↑ Deb, Siddhartha, "Arundhati Roy, the Not-So-Reluctant Renegade" Archived 6 जुलाई 2017 at the वेबैक मशीन., New York Times Magazine, 5 March 2014. Retrieved 5 March 2014. ↑ "A for Ambedkar: As Gujarat's freedom march nears tryst, an assertive Dalit culture spreads". मूल से 16 September 2016 को पुरालेखित. ↑ अ आ Jaffrelot, Christophe (2005). Dr Ambedkar and Untouchability: Analysing and Fighting Caste. London: C. Hurst & Co. Publishers. पृ॰ 5. आई॰ऍस॰बी॰ऍन॰ 1850654492. ↑ "Attention BJP: When the Muslim League rescued Ambedkar from the 'dustbin of history'". Firstpost. 15 April 2015. मूल से 20 September 2015 को पुरालेखित. अभिगमन तिथि 5 September 2015. ↑ "Alphabetical List Of Former Members Of Rajya Sabha Since 1952". Rajya Sabha Secretariat, New Delhi. अभिगमन तिथि 5 March 2019. ↑ "'प्राचीन काल में हिन्दू गोमांस खाते थे'". ↑ अ आ इ Ambedkar, Bhimrao Ramji (1946). "Chapter X: Social Stagnation". Pakistan or the Partition of India. Bombay: Thackers Publishers. पपृ॰ 215–219. मूल से 12 September 2009 को पुरालेखित. अभिगमन तिथि 8 October 2009. ↑ "Constituent Assembly Debates Clause wise Discussion on the Draft Constitution 15th November 1948 to 8th January 1949". मूल से 24 May 2013 को पुरालेखित. अभिगमन तिथि 12 January 2012. ↑ Sheth, D. L. (नवम्बर 1987). "Reservations Policy Revisited". Economic and Political Weekly. 22: 1957–1962. JSTOR 4377730. ↑ "Constitution of India". Ministry of Law and Justice of India. मूल से 22 October 2014 को पुरालेखित. अभिगमन तिथि 10 October 2013. ↑ amanadas, Dr. K. "Kashmir Problem From Ambedkarite Perspective". ambedkar.org. मूल से 4 October 2013 को पुरालेखित. अभिगमन तिथि 17 September 2013. ↑ Sehgal, Narender (1994). "Chapter 26: Article 370". Converted Kashmir: Memorial of Mistakes. Delhi: Utpal Publications. मूल से 5 September 2013 को पुरालेखित. अभिगमन तिथि 17 September 2013. ↑ Tilak. "Why Ambedkar refused to draft Article 370". Indymedia India. मूल से 7 February 2004 को पुरालेखित. अभिगमन तिथि 17 September 2013. ↑ "Ambedkar with UCC". Outlook India. अभिगमन तिथि 14 August 2013. ↑ "One nation one code: How Ambedkar and others pushed for a uniform code before Partition". ↑ "Ambedkar And The Uniform Civil Code". मूल से 14 April 2016 को पुरालेखित. ↑ "Ambedkar favoured common civil code". मूल से 28 November 2016 को पुरालेखित. ↑ Chandrababu, B. S; Thilagavathi, L (2009). Woman, Her History and Her Struggle for Emancipation. Chennai: Bharathi Puthakalayam. पपृ॰ 297–298. आई॰ऍस॰बी॰ऍन॰ 8189909975. ↑ Dalmia, Vasudha; Sadana, Rashmi, संपा॰ (2012). "The Politics of Caste Identity". The Cambridge Companion to Modern Indian Culture. Cambridge Companions to Culture (illustrated संस्करण). Cambridge University Press. पृ॰ 93. आई॰ऍस॰बी॰ऍन॰ 0521516250. ↑ Guha, Ramachandra (2008). India After Gandhi: The History of the World's Largest Democracy. पृ॰ 156. आई॰ऍस॰बी॰ऍन॰ 978-0-06-095858-9. ↑ "Statistical Report On General Elections, 1951 to The First Lok Sabha: List of Successful Candidates" (PDF). Election Commission of India. पपृ॰ 83, 12. मूल (PDF) से 8 October 2014 को पुरालेखित. अभिगमन तिथि 24 June 2014. ↑ IEA. "Dr. B.R. Ambedkar's Economic and Social Thoughts and Their Contemporary Relevance". IEA Newsletter – The Indian Economic Association(IEA) (PDF). India: IEA publications. पृ॰ 10. मूल से 16 October 2013 को पुरालेखित (PDF). ↑ TNN (15 October 2013). "'Ambedkar had a vision for food self-sufficiency'". The Times of India. मूल से 17 October 2015 को पुरालेखित. अभिगमन तिथि 15 October 2013. ↑ Zelliot, Eleanor (1991). "Dr. Ambedkar and America". A talk at the Columbia University Ambedkar Centenary. मूल से 3 November 2013 को पुरालेखित. अभिगमन तिथि 15 October 2013. ↑ "Round Table India — The Problem of the Rupee: Its Origin and Its Solution (History of Indian Currency & Banking)". Round Table India. मूल से 1 November 2013 को पुरालेखित. ↑ "Ambedkar Lecture Series to Explore Influences on Indian Society". columbia.edu. मूल से 21 December 2012 को पुरालेखित. ↑ Keer, Dhananjay (2005) . Dr. Ambedkar: life and mission. Mumbai: Popular Prakashan. पपृ॰ 403–404. आई॰ऍस॰बी॰ऍन॰ 81-7154-237-9. अभिगमन तिथि 13 June 2012. ↑ Sangharakshita (2006). "Milestone on the Road to conversion". Ambedkar and Buddhism (1st South Asian संस्करण). New Delhi: Motilal Banarsidass Publishers. पृ॰ 72. आई॰ऍस॰बी॰ऍन॰ 8120830237. अभिगमन तिथि 17 July 2013. ↑ अ आ इ ई Pritchett, Frances. "In the 1950s" (PHP). अभिगमन तिथि 2 अगस्त 2006. ↑ अ आ Ganguly, Debjani; Docker, John, संपा॰ (2007). Rethinking Gandhi and Nonviolent Relationality: Global Perspectives. Routledge studies in the modern history of Asia. 46. London: Routledge. पृ॰ 257. OCLC 123912708. आई॰ऍस॰बी॰ऍन॰ 0415437407. ↑ अ आ Quack, Johannes (2011). Disenchanting India: Organized Rationalism and Criticism of Religion in India. Oxford University Press. पृ॰ 88. OCLC 704120510. आई॰ऍस॰बी॰ऍन॰ 0199812608. ↑ Sinha, Arunav. "Monk who witnessed Ambedkar's conversion to Buddhism". मूल से 17 April 2015 को पुरालेखित. ↑ Buddha or Karl Marx – Editorial Note in the source publication: Babasaheb Ambedkar: Writings and Speeches, Vol. 3 Archived 19 मार्च 2012 at the वेबैक मशीन.. Ambedkar.org. Retrieved on 12 August 2012. ↑ "Life of Babasaheb Ambedkar". मूल से 25 May 2013 को पुरालेखित. ↑ Sangharakshita (2006) . "After Ambedkar". Ambedkar and Buddhism (First South Asian संस्करण). New Delhi: Motilal Banarsidass Publishers Pvt. Ltd. पपृ॰ 162–163. आई॰ऍस॰बी॰ऍन॰ 81-208-3023-7. ↑ अ आ Kantowsky, Detlef (2003). Buddhists in India today:descriptions, pictures, and documents. Manohar Publishers & Distributors. ↑ "President, PM condole Savita Ambedkar's death". The Hindu. 30 May 2003. मूल से 19 January 2012 को पुरालेखित. ↑ Kshīrasāgara, Rāmacandra (1994). Dalit movement in India and its leaders, 1857–1956. New Delhi: M D Publications pvt Ltd.
↑ अ आ "Biographical Sketch, Member of Parliament, 13th Lok Sabha". parliamentofindia.nic.in. मूल से 20 May 2011 को पुरालेखित. ↑ "Baba Saheb". मूल से 5 May 2006 को पुरालेखित. ↑ "Homage to Dr Ambedkar: When all roads led to Chaityabhoomi". मूल से 24 March 2012 को पुरालेखित. ↑ Tripathi, Arun Kumar. "The BJP Has Swept UP But It Does Not Know the Way Ahead From Here". thewire.in (अंग्रेज़ी में). अभिगमन तिथि 31 मार्च 2017. ↑ "KCR's 125-feet Ambedkar statue is a mockery of the very spirit of Ambedkarism". The News Minute. 15 अप्रैल 2016. अभिगमन तिथि 31 मार्च 2017. ↑ "Kabali is boring, but its socio-political depths make it a blockbuster that wasn't". The News Minute. 23 जुलाई 2016. अभिगमन तिथि 31 मार्च 2017. ↑ आंबेडकर, डॉ. बाबासाहेब (2012). माझी आत्मकथा (मराठी में). ↑ Christopher Queen (2015). Steven M. Emmanuel, संपा॰. A Companion to Buddhist Philosophy. John Wiley & Sons. पपृ॰ 529–531. आई॰ऍस॰बी॰ऍन॰ 978-1-119-14466-3. ↑ Joshi, Barbara R. (1986). Untouchable! : Voices of the Dalit Liberation Movement. Zed Books. पपृ॰ 11–14. मूल से 29 July 2016 को पुरालेखित. ↑ Keer, D. (1990). Dr. Ambedkar: Life and Mission. Popular Prakashan. पृ॰ 61. मूल से 30 July 2016 को पुरालेखित. ↑ Bayly, Susan (2001). Caste, Society and Politics in India from the Eighteenth Century to the Modern Age. Cambridge University Press. पृ॰ 259. मूल से 1 August 2016 को पुरालेखित. ↑ Naik, C.D (2003). "Buddhist Developments in East and West Since 1950: An Outline of World Buddhism and Ambedkarism Today in Nutshell". Thoughts and philosophy of Doctor B.R. Ambedkar (First संस्करण). New Delhi: Sarup & Sons. पृ॰ 12. OCLC 53950941. आई॰ऍस॰बी॰ऍन॰ 81-7625-418-5. ↑ "Renaming Dr. Ambedkar in modern-day India stems from caste hatred". मूल से 31 March 2018 को पुरालेखित. अभिगमन तिथि 2 April 2018. ↑ "Bhimrao Ambedkar". c250.columbia.edu. अभिगमन तिथि 1 अप्रैल 2018. ↑ "The Greatest Indian after Independence: BR Ambedkar". IBNlive. 15 August 2012. मूल से 6 November 2012 को पुरालेखित. ↑ "The Greatest Indian". historyindia. मूल से 8 August 2012 को पुरालेखित. ↑ Planning Commission. "Member's Profile : Dr. Narendra Jadhav". Government of India. मूल से 23 October 2013 को पुरालेखित. अभिगमन तिथि 17 October 2013. ↑ Pisharoty, Sangeeta Barooah (26 May 2013). "Words that were". The Hindu. मूल से 17 October 2013 को पुरालेखित. अभिगमन तिथि 17 October 2013. ↑ Face the People — FTP: Nobel laureate Amartya Sen on economic growth, Indian politics. YouTube. 22 July 2013. मूल से 7 March 2016 को पुरालेखित. ↑ "Ambedkar my father in Economics: Dr Amartya Sen « Atrocity News". atrocitynews.com. मूल से 3 September 2012 को पुरालेखित. ↑ "The Messiah Volume 2, pg 23" (PDF). oshorajneesh.com. मूल से 22 April 2014 को पुरालेखित (PDF). ↑ "U.S. President Barack Obama on Dr. B.R. Ambedkar". Declaration of Empathy. मूल से 5 October 2014 को पुरालेखित. ↑ "One lakh people convert to Buddhism". The Hindu. 28 May 2007. मूल से 29 August 2010 को पुरालेखित. ↑ Fitzgerald, Timothy (2003). The Ideology of Religious Studies. Oxford University Press. पृ॰ 129. आई॰ऍस॰बी॰ऍन॰ 978-0-19-534715-9. ↑ M.B. Bose (2017). Tereza Kuldova and Mathew A. Varghese, संपा॰. Urban Utopias: Excess and Expulsion in Neoliberal South Asia. Springer. पपृ॰ 144–146. आई॰ऍस॰बी॰ऍन॰ 978-3-319-47623-0. ↑ Michael (1999), p. 65, notes that "The concept of Ambedkar as a Bodhisattva or enlightened being who brings liberation to all backward classes is widespread among Buddhists." He also notes how Ambedkar's pictures are enshrined side-to-side in Buddhist Vihars and households in India|office = Labour Member in Viceroy's Executive Counciln Buddhist homes. ↑ "Magazine / Land & People: Ambedkar in Hungary". The Hindu. Chennai, India. 22 November 2009. मूल से 17 April 2010 को पुरालेखित. अभिगमन तिथि 17 July 2010. ↑ "डॉ.बाबासाहेब आंबेडकर यांचा शाळा प्रवेश दिन आता विद्यार्थी दिवस". www.esakal.com (मराठी में). अभिगमन तिथि 16 मई 2018. ↑ "राज्यघटनेचे शिल्पकार डॉ. बाबासाहेब आंबेडकर यांच्या प्रीत्यर्थ ७ नोव्हेंबर 'विद्यार्थी दिवस'". Lokmat (मराठी में). 28 अक्टूबर 2017. अभिगमन तिथि 16 मई 2018. ↑ "बाबासाहेब आंबेडकरांचा शाळा प्रवेश दिन "विद्यार्थी दिवस' ओळखला जाणार | Dainik Prabhat, Marathi News Paper, Pune". www.dainikprabhat.com (अंग्रेज़ी में). अभिगमन तिथि 16 मई 2018. ↑ "आंबेडकरांचा शाळा प्रवेश दिन आता विद्यार्थी दिवस". Loksatta (मराठी में). 28 अक्टूबर 2017. अभिगमन तिथि 16 मई 2018. ↑ "Government of India formally notifies November 26 as Constitution Day". onelawstreet.com. अभिगमन तिथि 20 November 2015. ↑ "Govt. to observe November 26 as Constitution Day". द हिन्दू. 11 October 2015. अभिगमन तिथि 20 November 2015. ↑ "November 26 to be observed as Constitution Day: Facts on the Constitution of India". इंडिया टुडे. 12 October 2015. अभिगमन तिथि 20 November 2015. ↑ "Law Day Speech" (PDF). Supreme Court of India. अभिगमन तिथि 20 November 2015. ↑ Uttar Pradesh Chief Minister Mayawati made it clear after the fatwa against it by an Islamic seminary. "Fatwa on BSP Slogan Sparks Off Debate". ↑ Ramteke, P. T. Jai Bhim che Janak Babu Hardas L. N. (मराठी में). ↑ Jamnadas, K. "Jai Bhim and Jai Hind". ↑ नीला रंग आखिरकार बाबा साहब डॉ भीमराव आंबेडकर के साथ क्‍यों जुड़ा है? ↑ Calvi, Nuala (23 May 2011). "The top five political comic books". CNN. मूल से 9 January 2013 को पुरालेखित. अभिगमन तिथि 14 April 2013. ↑ Gibbs, Jonathan (14 April 2015). "B. R. Ambedkar's 124th Birthday: Indian social reformer and politician honoured with a Google Doodle". The Independent. मूल से 14 April 2015 को पुरालेखित. अभिगमन तिथि 14 April 2015. ↑ "B R Ambedkar 124th birth anniversary: Google doodle changes in 7 countries as tribute". The Indian Express. 14 April 2015. मूल से 7 July 2015 को पुरालेखित. ↑ "Google's BR Ambedkar birth anniversary doodle on 7 other countries apart from India". dna. 14 April 2015. मूल से 7 July 2015 को पुरालेखित. ↑ "B.R. Ambedkar, a hero of India's independence movement, honoured by Google Doodle". Telegraph.co.uk. 14 April 2015. मूल से 5 January 2016 को पुरालेखित. ↑ "Resurgence of an icon Babasaheb Ambedkar". ↑ Viswanathan, S (24 May 2010). "Ambedkar film: better late than never". The Hindu. मूल से 10 September 2011 को पुरालेखित. ↑ Blundell, David (2006). "Arising Light: Making a Documentary Life History Motion Picture on Dr B. R. Ambedkar in India". Hsi Lai Journal of Humanistic Buddhism. 7. मूल से 6 November 2013 को पुरालेखित. अभिगमन तिथि 17 July 2013. ↑ Ramnara (5 March 2014). "Samvidhaan: The Making of the Constitution of India (TV Mini-Series 2014)". IMDb. मूल से 27 May 2015 को पुरालेखित. ↑ Anima, P. (17 July 2009). "A spirited adventure". The Hindu. Chennai, India. मूल से 2 January 2011 को पुरालेखित. अभिगमन तिथि 14 August 2009. इंटरव्यूः कांग्रेस-बीजेपी को क्यों अच्छे लगने लगे अंबेडकर?